Blake was a devoted printmaker for the whole of his life: he was apprenticed in 1772 at the age of 14 to the engraver James Basire, and began an ordinary career as a commercial engraver. From early childhood he claimed to see visions. The vivid clarity with which Blake beheld such mystic experiences, and the inspiration to delineate them accordingly, resolved his distaste for the ‘blotting and blurring art’ of the Venetians, of Rembrandt, of Reynolds. His preference was for linear purity, declaring in 1809 that ‘the more distinct, sharp, and wirey the bounding line, the more perfect the work of art’. The probing line of the engraver’s burin met this requirement entirely. 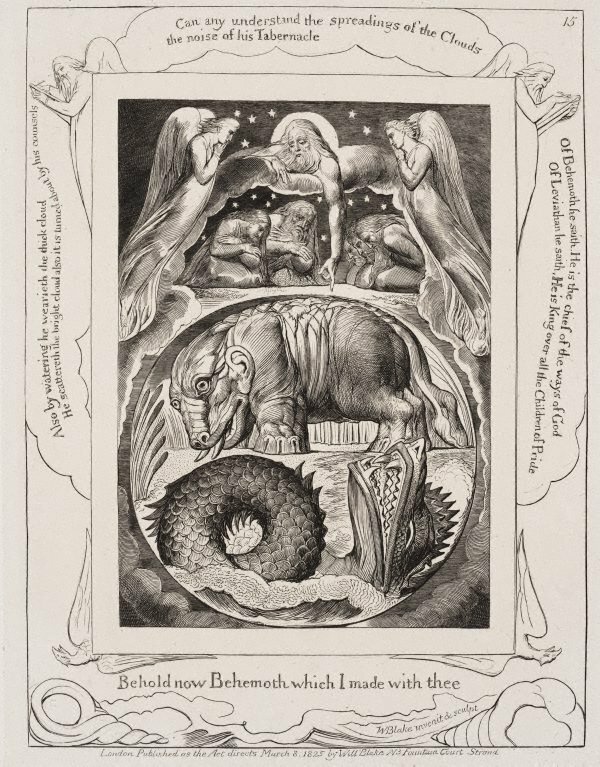 Blake’s distinctive brilliance as a line engraver is at its most accomplished in his late prophetic work, the 21 Illustrations of the Book of Job. The prints are based on watercolours done between 1805 and 1810, but it was the painter John Linnell who persuaded the elderly artist to return to the story of the Old Testament patriarch – a figure with whose sufferings the neglected and impoverished Blake evidently identified – and execute the engravings. The original water- colours are now in The Morgan Library & Museum, New York. A second set was produced in 1821 (Fogg Museum, Harvard and elsewhere) to serve as models for the engravings. Blake made the illustrations in a combination of portrait and landscape format, but unlike the watercolours the engravings unite word and image, with decorative borders containing quotes from the Book of Job and other scriptures, selected to emphasise Blake’s personal reading of the story. In the biblical narrative Job is represented as a righteous and prosperous man who observes his faith. In order to test that faith God allows Satan to subject Job to a series of terrible punishments. But Job remains steadfast in his belief in the Lord through all his adversity and is eventually rewarded with the restoration of his family and possessions. In Blake’s version, however, Job is a tragically flawed figure. Because he complacently adheres to the legalistic aspects of religion alone, he comes to (mis)understand God as a punitive and tyrannical Jehovah. For the first half of the series, Blake’s Job remains cut off from the realisation of a fully inspired spiritual life. The complacency of a limited faith based on the letter of the law is the subject of the first illustration: Job and his family are gathered in prayer under an oak tree with a church (symbolizing established religion) in the distance. Despite the idyllic appearance of the scene, Blake inscribes it with the telling quotation: 'The Letter Killeth/ The spirit giveth life'. Job’s embarkation on the path to spiritual renewal is secured after a series of visions in which the mysterious divinity of creation is vouchsafed to him by the Lord. In plate 14, Blake’s most jubilant design, an omnipotent God issues forth the chariots of the sun and moon while angelic hosts raise their arms in praise; in the terrestrial sphere, Job, joined by his wife and friends, worships in awe before the glory of the created universe.